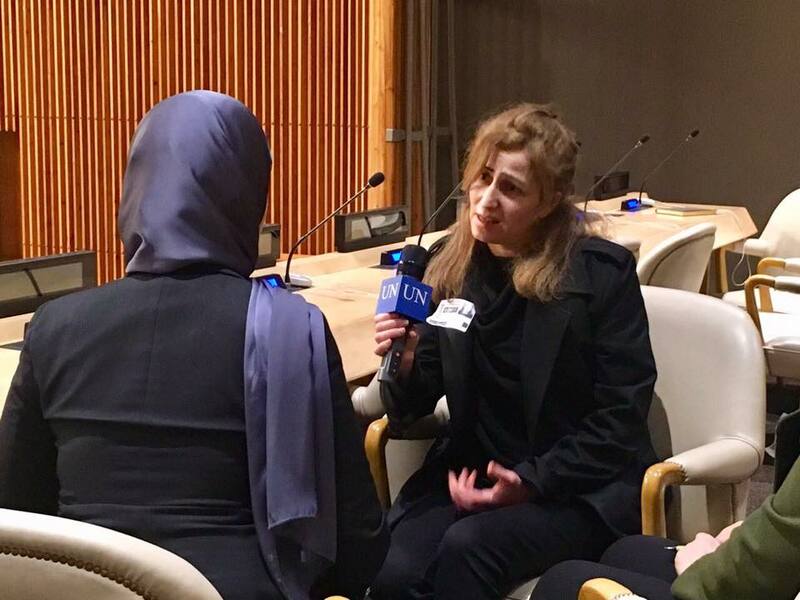 On December 18th and 19th, 2017, HAWAR.help was in New York City at the Headquarters of the United Nations for a series of meetings and a screening of the Hawar – A Cry for Help documentary. The purpose of the trip was to bring light to how sexual violence is being used as a tactic of war and terror in the case of Yazidi women held captive by ISIS. 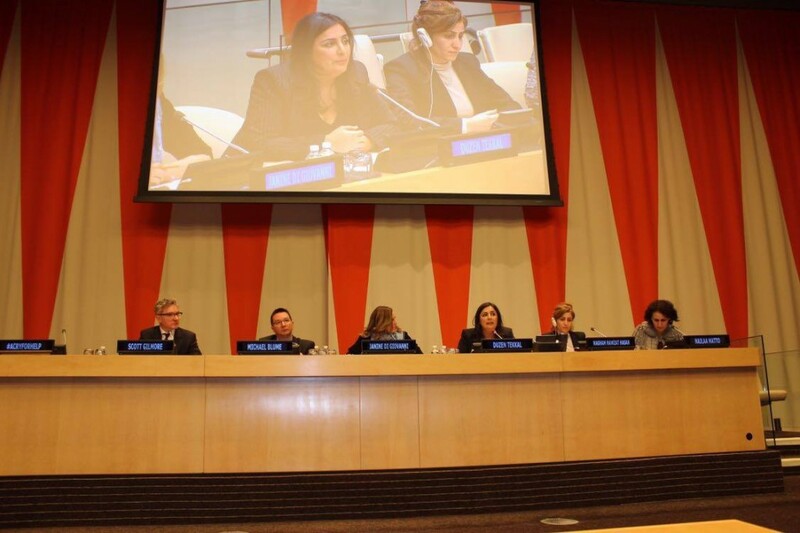 The events were hosted by the Office of the Special Representative of the Secretariat General on Sexual Violence in Conflict at the United Nations, the Permanent Mission of Germany to the UN, and the Permanent Mission of Iraq to the UN. 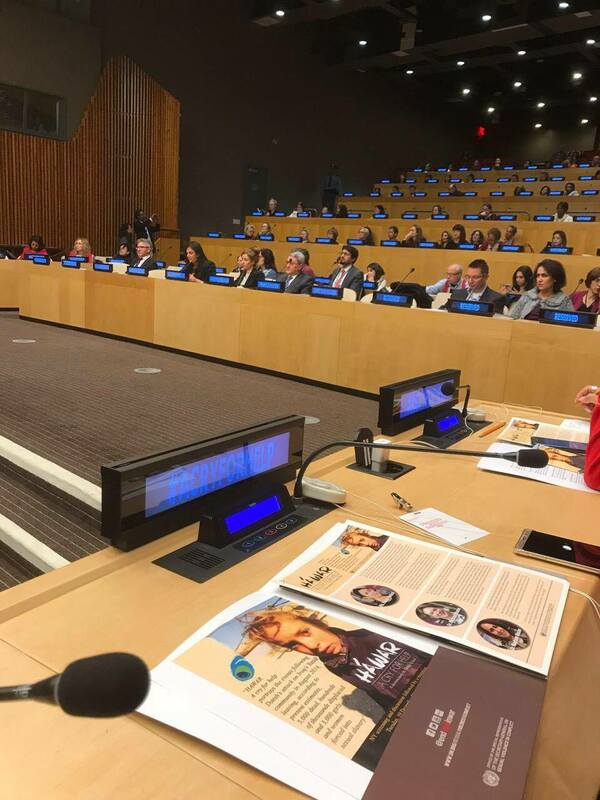 On the evening of December 19th, more than 300 people gathered at the United Nations Headquarters to view the “Hawar – A cry for help” documentary and listen to a panel discussion. Ms. Pramila Patten, Special Representative of the Secretary- general on Sexual Violence in Conflict, opened the event with praise for HAWAR.help, speaking of the impact of the documentary, “screening tonights documentary provides us with an opportunity to show the world that the UN stands in solidarity with every victim of DAESH crimes and every survivor of sexual violence”. German Ambassador to the UN Dr. Christoph Heusgen followed Ms. Patten boldly exclaiming to the audience, “we need to break the silence surrounding the atrocities that have been committed by ISIS”. Dr. Heusgen went on to state, “victims must be at the center of our efforts to address atrocity crimes”. Following the screening, HAWAR.help founder Düzen Tekkal was joined by ISIS survivor Najlaa Matto, Dr. Michael Blume, Head of the Special Quota Project, State Ministry of Baden-Württemberg, Dr. Nagham Nawzat Hasan, Iraqi Yazidi Gynecologist and Mr. Scott Gilmore, Staff Attorney at the Center for Justice and Accountability for a panel discussion. Nailaa Matto powerfully told the audience that her mission is to bring the perpetuators to justice stating, “I am strong. I am stronger than ISIS”. To view the entire event click here. The HAWAR.help team had a conversation with German Ambassador to the United Nations Dr. Christoph Heusgen at the German Permanent Mission, where we agreed that empowering women should be central to integration policies worldwide. 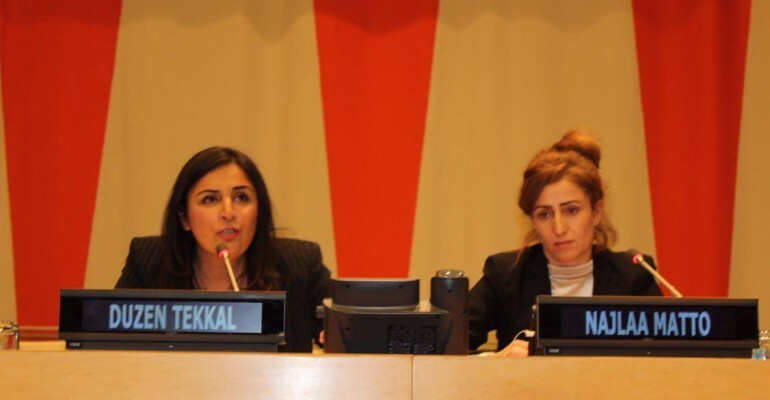 Following the meeting, Düzen Tekkal was joined by Najlaa Matto for a meeting at the Iraq Permanent Mission to the UN, where they were warmly greeted and spoke of the continued fight against ISIS and the terrors facing the Yazidi community. 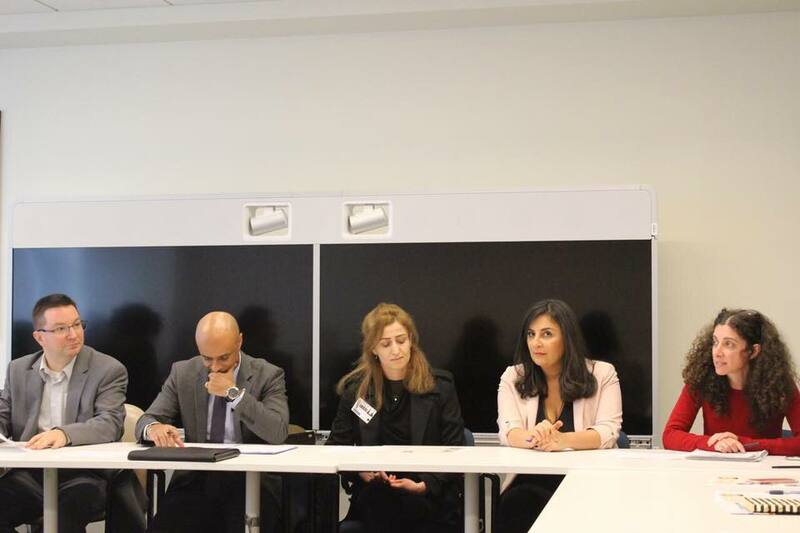 The office of the Special Representative of the Secretary General on Sexual Violence in Conflict to the UN hosted a brownbag meeting with representatives from the UN and member states on how to support the Yazidi survivors of sexual violence. 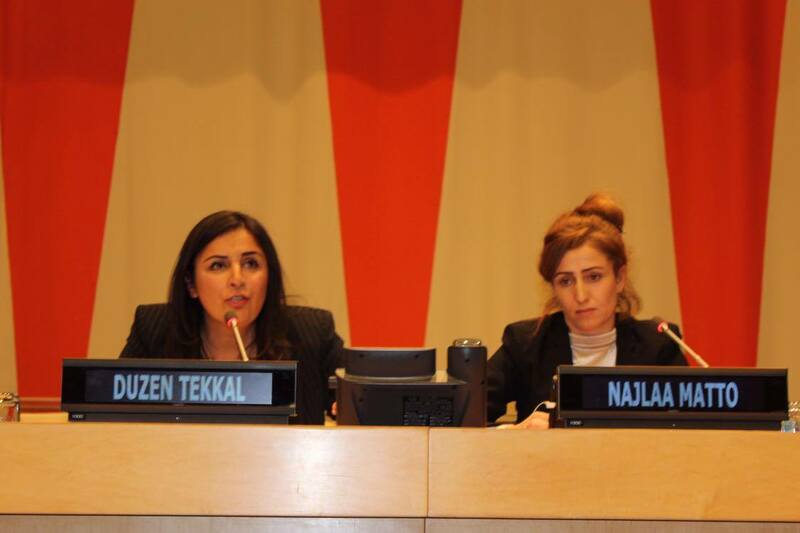 Düzen Tekkal, Najlaa Matto and Dr. Michael Blume all had the opportunity to speak. Dr. Blume called on the international community for more support stating, “no genocide should be hidden. If every country does a small part to support women who have been used as sexual slaves in war we can change this situation. Victims will become survivors”. Düzen Tekkal was interviewed alongside Dr. Michael Blume for the UN news. Düzen deliberately stated, “We have to find solutions to fight terrorism. These brave women that were in the hands of ISIS are one of the answers. I tried to use this documentary as a positive weapon so that people know what is happening”.